Count on Rottweil Slugs to be carefully designed and precisely produced. You get excellent quality and consistency delivering you the decisive edge of a high energy release while on the hunt. 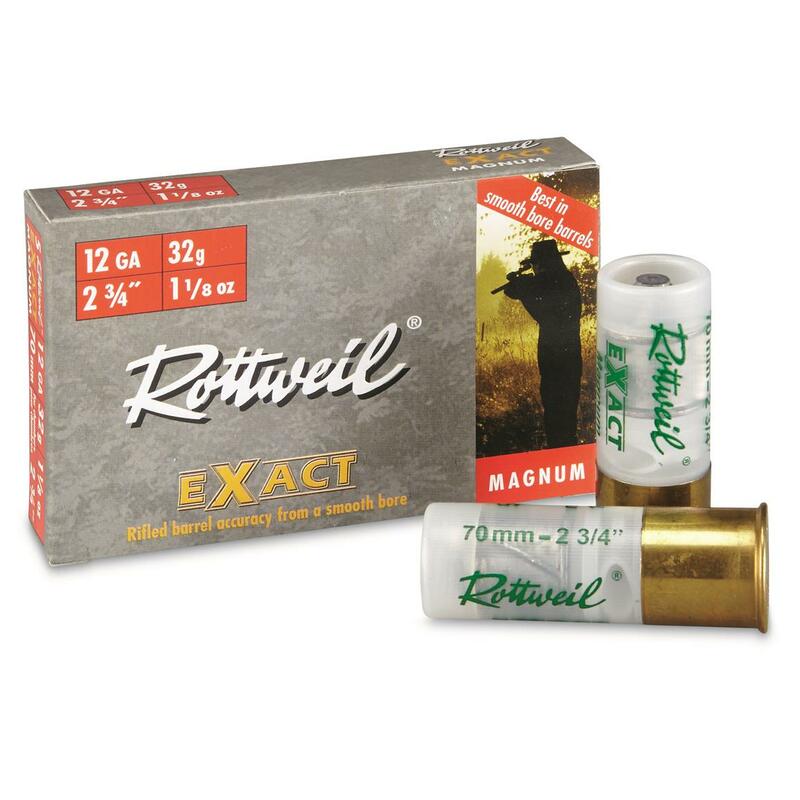 Rottweil Exact Magnum, 12 Gauge, 2.75 , 1 1/8 oz. Slug, 5 Rounds is rated 5.0 out of 5 by 1. Rated 5 out of 5 by Kelley W from Do not fool yourself These slugs perform excellent out of any smoothbore with a cylinder or improved cylinder choke. Out of a Remington 870 with a 18 inch-rifled sights-cylinder choked barrel, I could manage to keep a 3 inch group at 50 yards. Plenty of accuracy for taking Whitetails within decent ranges. Recoil is tolerable, but not bad. The wide ribs on the slug's design is built to grip the gun's bore in order to enhance accuracy. Yep, just like the ole' Brenneke's you older guys grew up with. No complaints from me with this slug. I have tested many slug brands over the years and I have my favorites, but this load is in the top 5 for me. Keep in mind I am testing rifled slugs not sabot slugs (two different loads). I favor the rifled slugs since they are cheaper and most deer kills for me are within 50 yards. Extremely accurate with low recoil.